The following 3D printer reviews are from the perspective of a librarian trying to find the most suitable device for Delaware’s public libraries. I’m not a mechanic. I’m not an engineer. I’m not a computer programmer. I’m not a graphic designer. I’m a librarian with a tendency toward tinkering and creative thinking. The Division of Libraries purchased eight Ultimaker Originals (UO) as kits, direct from the manufacturer in The Netherlands. At the time we knew very little about 3D printers and their assembly. It therefore took longer than anticipated to build and deploy the printers in the seven public libraries that volunteered to beta test this technology. Assembly was challenging, especially keeping track of all the various sized nuts, bolts, washers, and laser cut wood pieces. The greater task was in calibration – making sure all the parts worked together smoothly. I contacted Ultimaker Support frequently. 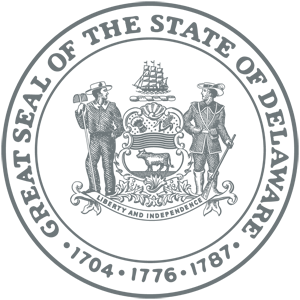 While they were very helpful, as of 2013 they were a small company located in another continent and time zone. At least once I had to wait nearly two weeks to get a response; their support staff were at a 3D printing conference. The ones fluent in English were unavailable. In retrospect, I am glad I had the opportunity to build these printers rather than purchasing them completely assembled. I learned how 3D printers are intended to work, the proper names of the multiple parts, and how to diagnose the results when the printer is not working correctly. I now know which way the pulleys are intended to move, the direct effect of each stepper motor, and how one loose bolt can be the cause of a disastrous print. These printers are ideal for tinkerers, those with the curiosity to investigate the cause of a failed print and not afraid to find the solution. The UO requires a lot of maintenance, tightening of bolts, and frequent recalibration. Unfortunately, this workflow does not fit in with that of a busy public library staff person. The UOs have created a lot of issues for the library staff all over the state. A number of the libraries with UOs have needed regular assistance with maintaining their printers. Overall, the UO is an excellent machine to learn about 3D printing. Its open platform permits easy maintenance and the opportunity to upgrade for those who desire a dual extruder. It’s a hearty machine that with the right kind of maintenance and care can last a long time. Finding the UOs to be a poor fit for most of the libraries, we tested the MakerBot Replicator 2, which seemed to be the most popular brand and model in 3D printing at the time. We opened the large cardboard box, carefully removed the large metal-framed printer, discarded the packing material, plugged in the cord to the electrical outlet, and voila – we were greeted by the cheerful blipping of our newest device. The first couple of prints were smooth and beautiful. We were awed by the ease in using the mini LCD screen and SD card. An SD card meant freedom from having to tether the printer to a computer while in use. Our awe was cut short at the first clogged nozzle, which was followed soon after by the next clog, and the next, and the next. Unclogging the nozzle is a tedious task that involves opening the extruder to clear out the nozzle and clean the drive gear (feeder mechanism). We have had to replace the bar mount assembly twice, and are now replacing the ceramic insulation tape a second time. Diagnosing the issues with MakerBot Support has been a difficult process. Each time I opened a case it seemed they wanted to know when I purchased the printer, the serial number, the invoice number – overall too much information that they should already have on file. I opened cases to find they closed it before I had a chance to respond. I was not impressed. I reopened cases only to encounter a different support specialist and needed to recount the interactions with the previous support staff. We purchased a MakerBot Replicator 2X, an Experimental Printer, at the same time as the Rep2. We were curious about the dual extruder capabilities. It wasn’t until after we unpacked this printer and began using it that we learned it is intended to print with ABS filament exclusively. So we purchased a small selection of ABS filament, enough to populate both extruders. I never quite perfected the dual extrusion capabilities – only two successes out of numerous attempts. In sum, I do not recommend future 3D printer purchases from MakerBot. 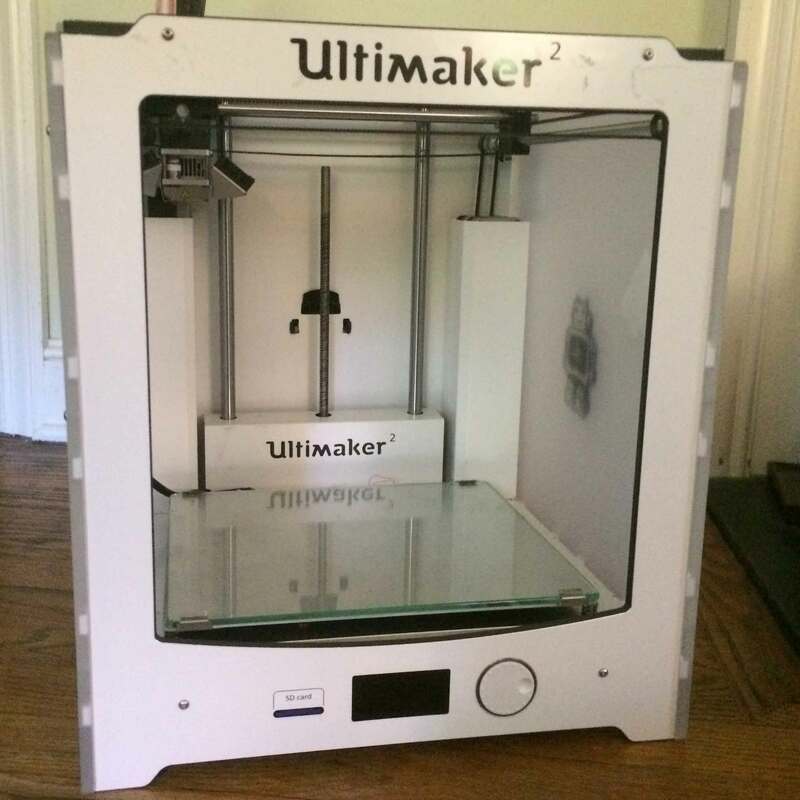 By this time the Ultimaker 2 (U2) had been released for sale and had been receiving excellent reviews. Noting the “fair” experience with the UO and the poor results of the MakerBot, we thought we’d stick with the brand that was most familiar. So we tested a U2. I had a limited testing time this printer initially. It appeared Ultimaker took the UO and upgraded to include the aspect of the MakerBot Replicator 2 that I disliked the most – the feeder mechanism. Despite my wariness, it seemed to print nicely. I deployed this printer to a library already familiar with the UO and the Cura software. Staff there loved it. For one week. I received reports that the feeder mechanism was grinding into the filament rather than pushing the filament forward into the hot end. These two parts are about one foot apart on this model. I proceeded to take the feeder mechanism apart as I would have for the MakerBot. I quickly learned that the U2 was nowhere nearly as friendly to the tinkerer as was its younger brother the UO. This was a closed machine; don’t mess with those bolts or you’ll never get them back in properly. This printer continues to display the same problems. I just can’t get it to work right. 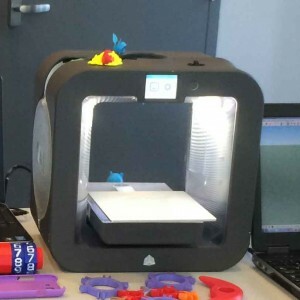 The Cube 3 came to our attention at a time when we were frustrated with both MakerBot and Ultimaker and pressured to find a feasible 3D printer for the public libraries. The Cube is compact, sleek, and extremely modern looking compared to other desktop 3D printers of its class. It takes up a fraction of the desk space of the MakerBot Replicator 2. The major selling point for the Cube was that it uses PLA filament that comes in a cartridge. Each cartridge has its own nozzle. Should a library staff person encounter a clogged nozzle, all she need do is switch out the filament cartridge and print. No more clearing out clogged nozzles. I have yet to figure out what to do with the remaining filament in the cartridge with the clogged nozzle. Those cartridges are expensive. That was my number one reason to doubt the efficacy of the Cube. The Cube works exclusively with software provided by 3D Systems – Cubify Invent, Design, and Sculpt. These software packages cost money per license. Our intention was to test it at DDL then deploy to a library using a different computer. More money. With more intense searching we were able to find and download the Cubify app at no cost. My number two reason to doubt this printer. After much frustration we learned that the Cube works best using Wifi. The USB port on the Cube serves no identifiable purpose. The Cube will not print from a flash drive nor by USB connection to a computer. It will not work with the web authentication required in Delaware’s public libraries. The only way we have managed to use this printer successfully is through its “ad hoc” feature, using the Cube’s own Wifi signal to connect to a laptop, from which the print file is transmitted. It’s all very confusing and in my opinion not worth the effort since the transmission fails at least 50% of the time. I avoid operating the Cube. 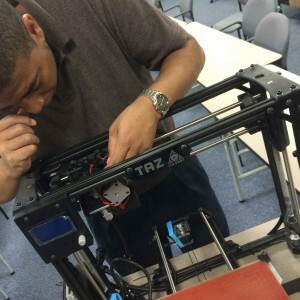 We tested the PrintrBot Metal Plus at the request of one of the libraries. An enthusiastic community member who volunteers his time and expertise at this library recommended this printer. Happily, the printer came fully assembled. It looks very industrial with its black metal frame and exposed wiring. Like the UO, it needs to be tethered to a computer at all times via a USB cord. Also like the UO, the recommended software to interact with the printer is Cura, though it’s open to other software options with which I am unfamiliar. Also new to me is that the PrintrBot requires use of the advanced print feature within Cura called PronterFace. Other than having to learn this feature, the prints were smooth and nice the entire testing period. I would be open to learning more about the features of the PrintrBot Metal Plus. My favorite 3D printer by far (don’t tell the UOs) is the LulzBot Mini. The Mini is very similar in appearance to the PrintrBot – black metal frame, heated bed, USB tether. Parts of the printer are clearly printed on a 3D printer. Included with the Mini were all the tools I had to purchase for using the other printers tested previously – spatula, tweezers, Allen wrenches, and more. And some LulzBot swag which is always a nice perk! While this brand of printer is open to various software, the recommended software is Cura for LulzBot – which functions pretty much the same as the Cura used with the Ultimakers, only it has a green background. Changing filament is extremely easy and fast compared to doing so on the other printers. This is the fastest printer I’ve tested to date. I’ve taken this printer on the 3D Printer Road Show and have not had any issues with clogged nozzles, bed recalibration, or the feeder mechanism. I have already recommended this printer on several occasions and will continue to do so. I separate the LulzBot Taz 5 from the Mini for several reasons. First and foremost, I have much less experience with the Taz. It is huge for a desktop printer, too big to carry around on the Road Show. It looks just like the mini, only larger. I will comment further as I continue to gain experience with use. 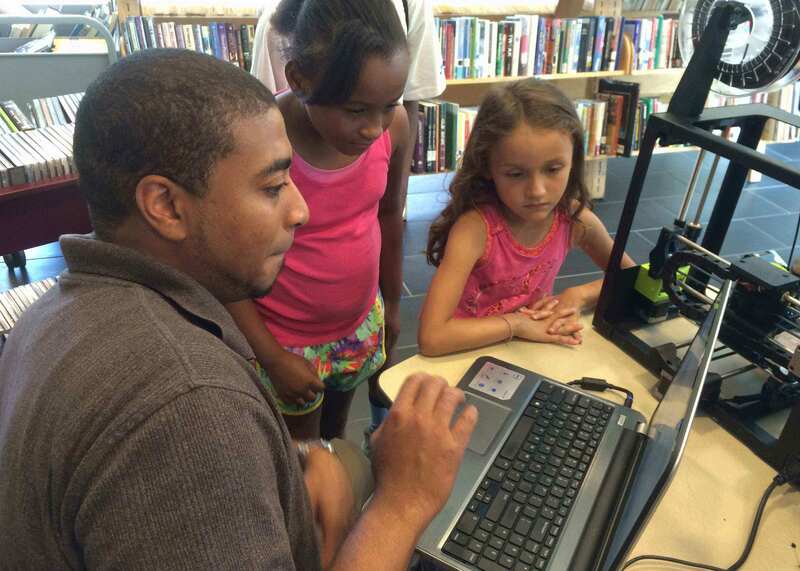 DDL staff showing young patrons how to navigate Thingiverse, an online repository of digital images. The 3D Printer Road Show came to a roaring conclusion the final week of August as we visited four libraries in New Castle County. 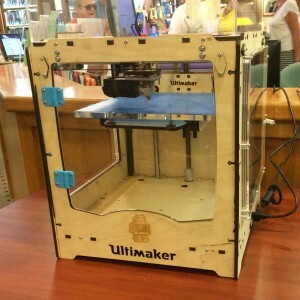 Early in June the Division of Libraries offered to visit each Delaware public library for a day to demonstrate a variety of 3D printers, introduce 3D modeling, and discuss the state of 3D printing in public libraries throughout the country. Fifteen libraries welcomed us into their space over the course of July and August. We started somewhat centrally at Appoquinimink, south to Selbyville, north to New Castle, then Delmar, North Wilmington, Delaware City, Newark, Millsboro, Woodlawn, Harrington, Elsmere, Hockessin, Corbit-Calloway Memorial, Brandywine Hundred, and ended at Garfield Park Library on August 31. 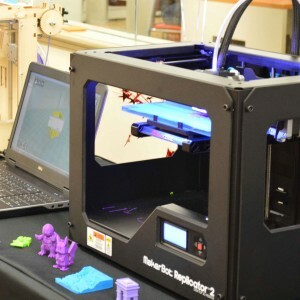 The 3D Printer Road Show was also intended to inspire Delawareans to think of what they could do even if they don’t have an actual 3D printer. An ideal response was from a patron at the Elsmere Library (which by the way has no 3D printer) who had designed her own 2D object on paper, fan art inspired by the popular video game series Final Fantasy. 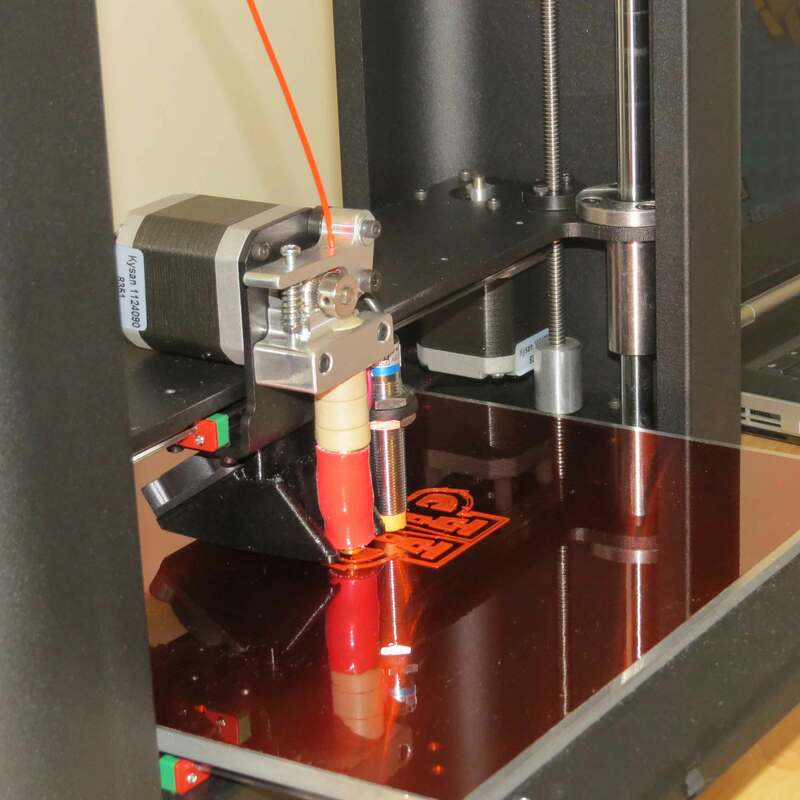 With our guidance, she scanned it on the library’s new flatbed scanner and converted it to the appropriate .STL (STereoLithography) file format for printing on the 3D printer we brought for the Road Show. At the same library, staff are now eagerly learning TinkerCAD, an easy to learn and free 3D modeling software program anyone can access through the Internet. 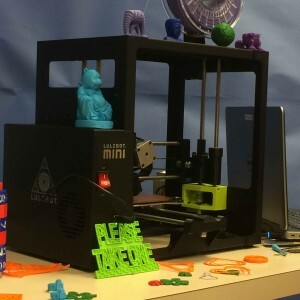 Their goal is to teach basic modeling to patrons, knowing if their desired end goal is to print they can send a print request to one of the other libraries in Delaware that does offer 3D printing services. 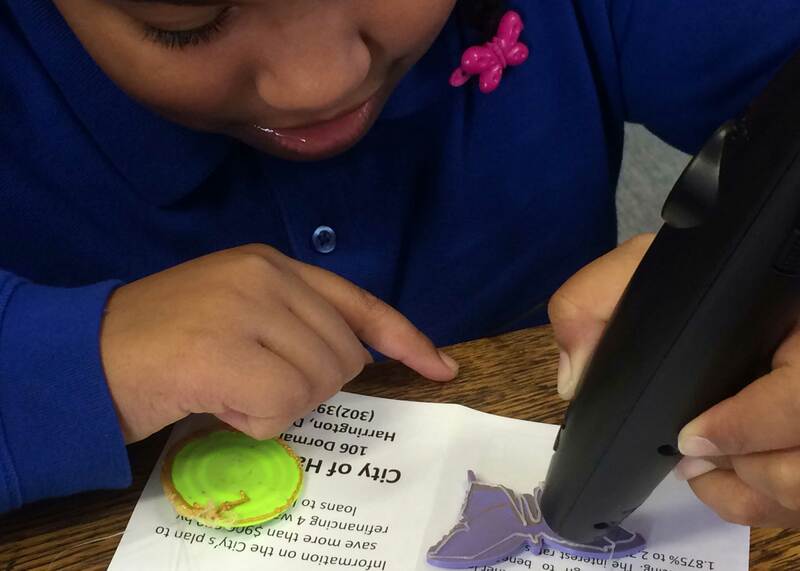 Embellishing a 3D printed butterfly with a 3Doodler. Twin 11-year old girls at the Harrington Library (no 3D printer there, either) embellished a 3D printed butterfly using our 3Doodler. They thought of this idea completely on their own. To our surprise, these girls referred to SketchUp and Cura (two 3D modeling software available on every public library computer in Delaware) as “games” in which they designed their own houses – they had no idea this software interacted with 3D printers. We encountered numerous other examples of ways the 3D Printer Road Show inspired innovative ideas, created opportunities for collaboration, and, I like to think, planted the seeds for future STEM professionals. Please visit the Delaware Libraries Flickr album for more photographs from the 3D Printer Road Show. Learn more about 3D printing in the DDL LibGuide Unleash Inner Genius: 3D Printers and Modeling or ask at your local public library. *There are soon to be 12 public libraries in Delaware that offer 3D printing services. Each is listed in the above-mentioned LibGuide.